10. For a Song . . . This is the story of one filmmaker’s search for a Broadway that was lost and the 100 legends that he found. 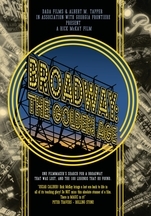 BROADWAY: THE GOLDEN AGE is the most important, ambitious, and comprehensive film ever made about America’s most celebrated indigenous art form. It is award-winning filmmaker Rick McKay’s journey over four continents and five years to find out whether there had been a golden age of theatre and why it had never been documented. He soon learned that great films can be restored, fine literature can be kept in print, but historic Broadway performances of the past are the most endangered. They leave only memories that, while more vivid, are more difficult to preserve. In their own words–and not a moment too soon–BROADWAY: THE GOLDEN AGE tells the stories of our theatrical legends, how they came to New York, and how they created this legendary century in American theatre. Featuring JERRY ORBACH, ALEC BALDWIN, CAROL BURNETT, MARLON BRANDO, ELAINE STRITCH, EVA MARIE SAINT, ANGELA LANSBURY, and many others. Director’s commentary audio overlay, and 5.1 surround sound; total time nearly three hours.